Heat oven to 375°F. Bake biscuits as directed on bag. Meanwhile, in microwavable bowl, microwave vegetables as directed on package. Add tuna and Alfredo sauce; mix well. Microwave on High 2 to 3 minutes or until hot, stirring once. Split hot biscuits; place bottom halves on individual serving plates. Top each with one-fourth of the tuna mixture. Top each with biscuit top and remaining tuna mixture. Sprinkle each with cheese. 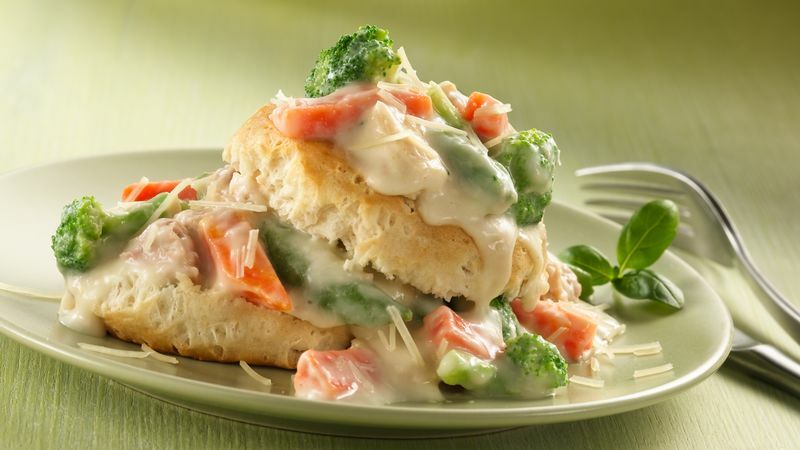 Pillsbury® Perfect Portions® refrigerated biscuits are packaged in pairs--perfect for a twosome.